Poster of Rajinikanth and Akhshay Kumar’s much awaited movie Enthiran 2.0 is out. Kumar in his villainous avatar perfectly matches the sci-fi concept of the movie. Though the lead star Rajinikanth is missing from the poster, it indeed looks captivating. 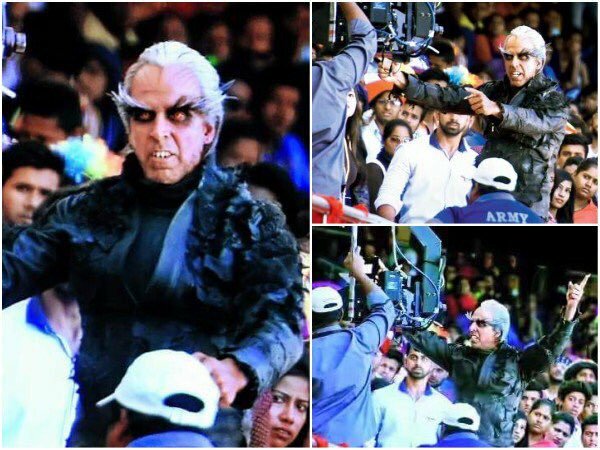 2.0 is an upcoming Indian Science fiction written and directed by S. Shankar. 2.0 is the sequel to 2010 Tamil blockbuster Enthiran (Robot in Hindi) and it is reportedly being made on a lavish budget of Rs 350 Crore. Superstar Rajinikanth shared a teaser of the first look of his hugely anticipated film with Shankar, 2.0. The first look of the film will be revealed on November 20, Rajinikanth informed on the poster, which features Akshay Kumar, who plays an eccentric scientist in the film. The makers of the film have released the poster of superstar Rajinikanth’s much-awaited film 2.0, days before releasing the first look of the film on Sunday. The poster features Bollywood actor Akshay Kumar in his villainous avatar, standing below the gigantic title. The poster indeed looks intriguing and does justice to sci-fi- genre. According to the reports the first look of the film will be released at a grand event at Yash Raj studios in Mumbai. The makers also confirmed that Bollywood filmmaker Karan Johar will be hosting the star-studded event, which will be graced by the film’s entire star cast. The event will be also live streamed on a YouTube channel. Raju Mahalingam, creative head, Lyca Productions said, “This is a global movie produced with a huge investment of Rs. 350 crore. To ensure that the first look of the movie is revealed in all grandiose, we are leaving no stone unturned. In the event hosted by Karan Johar, characters of Rajinikanth, who is playing three different roles and Akshay Kumar, who is playing a scientist will be revealed in 3-D.” The event is expected to cost a whopping amount of Rs. 6 crore. Besides two super stars Akshay Kumar and Rajinikanth, the movie has various other big names associated with it. Oscar winner AR Rahman has composed the music of this film. Another Oscar-winning sound designer Resul Pookurry has lent his expertize to this ambitious project. Slated for a release in early 2017, the movie also features Amy Jackson, Sudhanshu Pandey and Adil Hussain. The Khiladi of Bollywood has wisely teamed up with the king of South industry Rajinikanth to debut in Tamil industry. After the poster has already blown away our minds, it is getting really hard to wait for the first look of the movie.